In 2003 NIGHTSEA founder Dr. Charles Mazel had the privilege of being the Chief Scientist on the first-ever project to explore for fluorescence on the deep sea floor. The ONR-supported expedition used the Johnson Sea-Link manned submersible operated by Harbor Branch Oceanographic Institution, making a total of 18 dives to depths as great as 850 meters (2800 feet), at a variety of locations through the Bahamas. Custom-made excitation filters and filter holders converted the submersible’s powerful 400W HID lights into sources of blue light to excite fluorescence, while a custom barrier filter was fitted over the submersible’s camera so that fluorescence could be recorded on video. The observer in the submersible’s viewing sphere wore a pair of the NIGHTSEA yellow visor glasses. On these dives we discovered fluorescence in a variety of deepwater corals and anemones, as well as in sponges, crinoids, and other invertebrates. 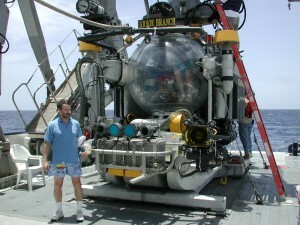 In 2004 another set of fluorescence exploration dives was made as part of Project DeepScope, supported by the NOAA Office of Ocean Exploration. 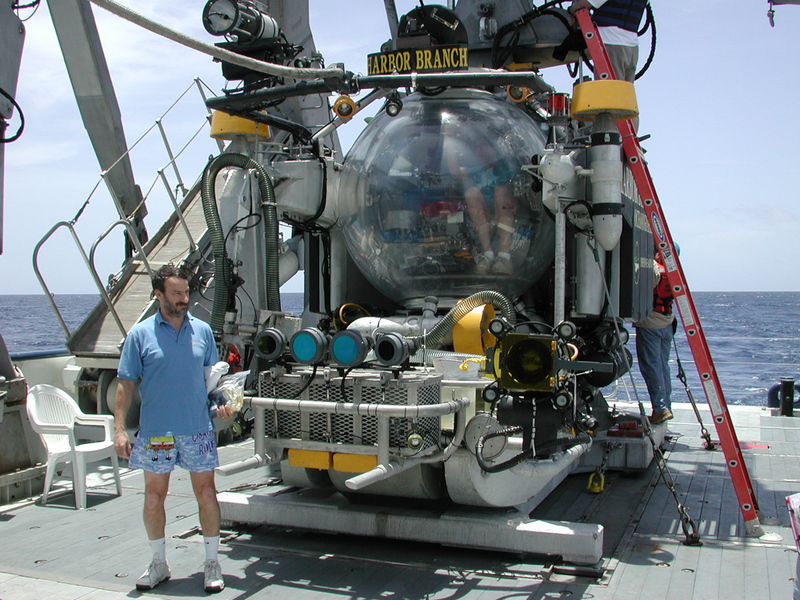 This wasn’t an all-fluorescence expedition, but some of the dives were dedicated to fluorescence using the same equipment that had been used in 2003. Besides Charlie Mazel, fluorescence participants included Dr. Michael Matz, who had made the breakthrough discovery on the nature of the fluorescing pigments in corals, Dr. Joerg Wiedenmann, and Dr. Eran Fuchs. You can read all about that expedition, and for fluorescence you should particularly check out the August 10 and August 16 logs, and the page on detecting fluorescence. Mike Matz used the NIGHTSEA filter set again on the DeepScope 2005 expedition and found another fluorescent shark. This one had the courtesy to settle on the bottom and pose for pictures.